Well, that hurt a bit more than I expected. I’d intended to write a post between the start and today’s (Wednesday’s) first rest day. But when the time came, I was exhausted enough to nod off while thinking about what to write, and it didn’t quite happen. So there’s a lot of ground to cover; the whole of stage one of my ride up the country. All the way from the Isles of Scilly up to Bristol. Sunshine and rain; hills and, erm, more hills; sweat and vomit. It’s all here. But we’d better start at the start. At the very end of the UK. 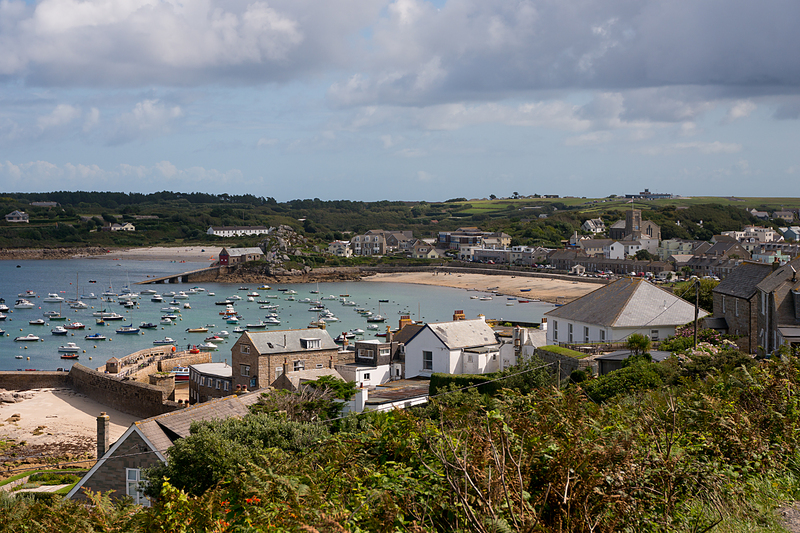 The Isles of Scilly are 30-odd miles into the Atlantic Ocean, south-west of the tip of Cornwall. St Agnes, which you can see in the background of the photo above, is the southernmost inhabited place in the UK. Despite being stuck out in the ocean, the Scillies seem to benefit from a microclimate, and were noticeably warmer than the rest of the country. 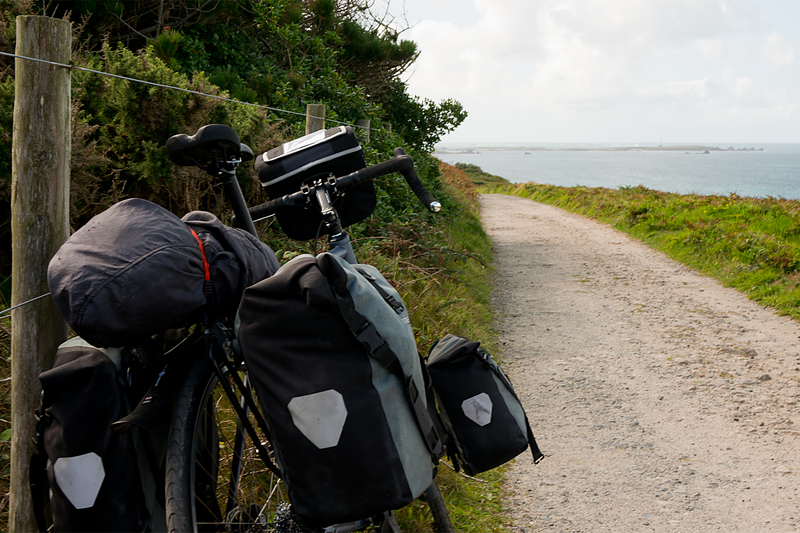 I had a little pootle around the main island, St Mary’s, partly to get used to riding with bags on again, and partly to calm the Beastlet, which was understandably traumatised after being consigned to a container for the trip over. A sit down overlooking the bay at Hugh Town (above), and a pint in (roughly) the third most southerly pub in the country, and my time on the islands was up. 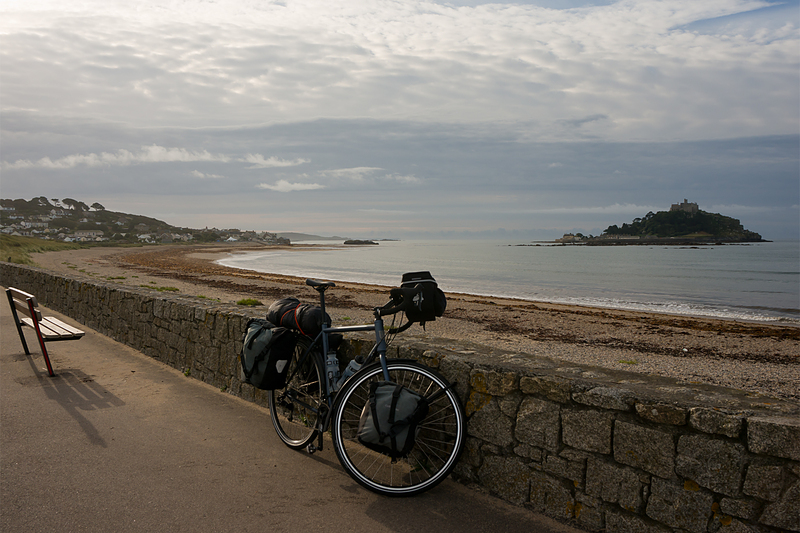 The grumbling bike was containerised again, and it was back to the mainland on Friday evening. The proper riding would begin the next morning. Tanked up on greasy food and coffee (as any sports nutritionist will tell you, it’s the only way to prepare for a long bike ride), it was time to move. The north awaited (well, everything’s north from here). And the hills. Pretty soon, Cornwall was teaching me lessons. Lesson 1 was that, if you want to avoid the main roads in the south west (which you probably do, as they’re basically 70 mph motorways full of trucks and caravans), you’re going to be punished by climbing hills. 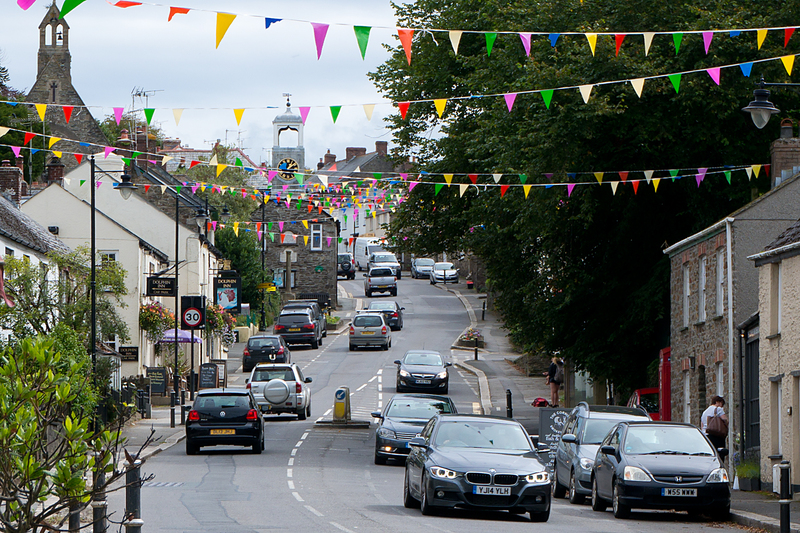 The smaller roads in Cornwall link the towns together, and pretty much every town seems to be on top of a vicious little slope (or at the bottom of a steep valley, which you need to climb out of). I’d later discover that in Devon, they don’t even bother to put towns on top of the hills; the roads just go there anyway. These small roads are nice and (fairly) quiet, and the countryside is lovely, but you’re not going to be setting any speed records in this part of the world. Lesson 2 taught me that, despite my earlier statements about being fit enough to get back to touring, my back’s still struggling a bit. Not so much with the cycling, but just with being up and about all day, bending and stretching, without the option of three or four hours in a comfy seat. I’m hoping that the rest day today will give it a chance to recover, and that things will get easier. We’ll see, I guess. Third, I’ve learned to avoid fish while I’m riding. That’s eating fish, obviously; it’s relatively easy to avoid running them over on the road. Top protein source that it is, fish has a greater chance than most food of, erm, going a bit wrong on you. And, as any sports nutritionist really will tell you, the explosive loss of half a day’s carbs and protein is not a good way to set yourself up for another day in the saddle. Sadly, that’s exactly what happened on Saturday night, and I wobbled across the border into Devon on Sunday afternoon, running on fumes. Leaving Cornwall, you get another reminder of the impact of the great Victorian engineer, IK Brunel, on the infrastructure of the south west. I’ve gone on about Big Isambard before while trundling around Bristol, so I won’t overdo it this time. But his railway bridge across the Tamar marks the end of Cornwall, and the beginning of England proper (Cornwall, or Kernow, is a little bit different from the rest of England, with its own Celtic language, which you might have noticed on the picture near the top of the post, and its own flag, which you see on a lot of cars and houses; some people there think it should be a separate country). Devon turned out to be a struggle. 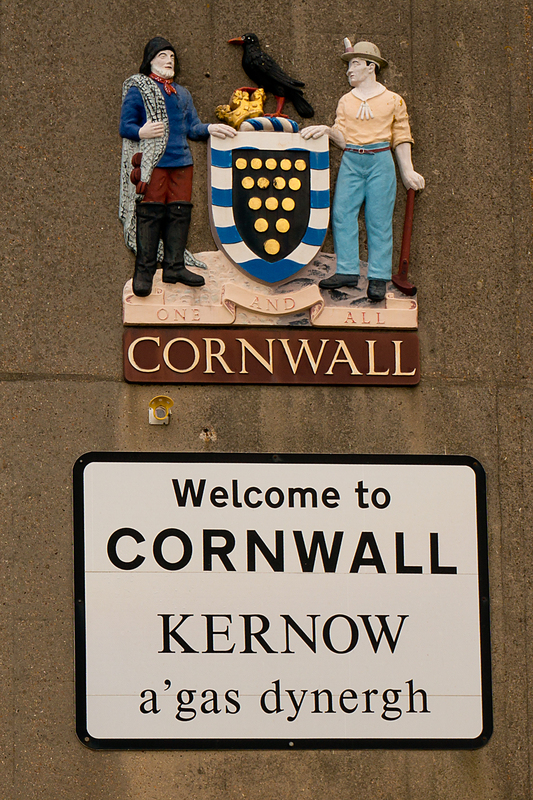 Having limped out of Cornwall, I assumed that a good feed and a decent night’s sleep would sort me out. I also assumed that the rolling Devon countryside would be a little kinder than Cornwall’s rocky outcrops. In fact, Monday was spent slogging up and down more hills. A lot more hills. My depleted energy levels made themselves felt again, and I finally rolled into Exeter absolutely stuffed. 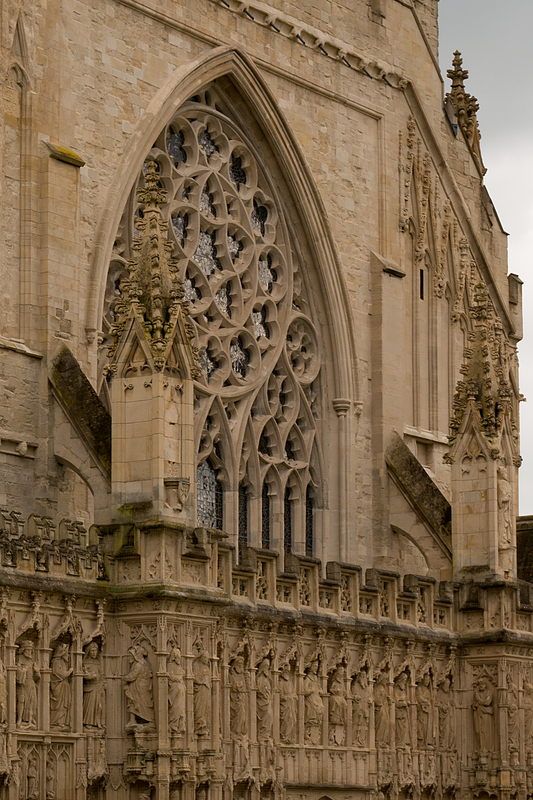 I had a sit down next to the fine cathedral, and pondered the facts. I had no energy left. And while that would have been fine at the end of the day’s ride, I wasn’t at the end of the day’s ride. I’d like to claim that I agonised over this for hours, but I really didn’t. I got on the train for the last few miles to Taunton. And spent the evening wondering whether I could actually make this trip work (or, at least, whether I needed to double the amount of time it’s going to take). But yesterday (Tuesday) was another day in every way. The sun was out. A proper sleep and feed seemed to have sorted me out. Or maybe it was just the psychological aspect; knowing you’re heading home for a rest day definitely makes things easier. It also helped that the first half of the day was across the Somerset Levels. As you may have inferred, the area has that name because it’s flat. Or at least mainly flat. 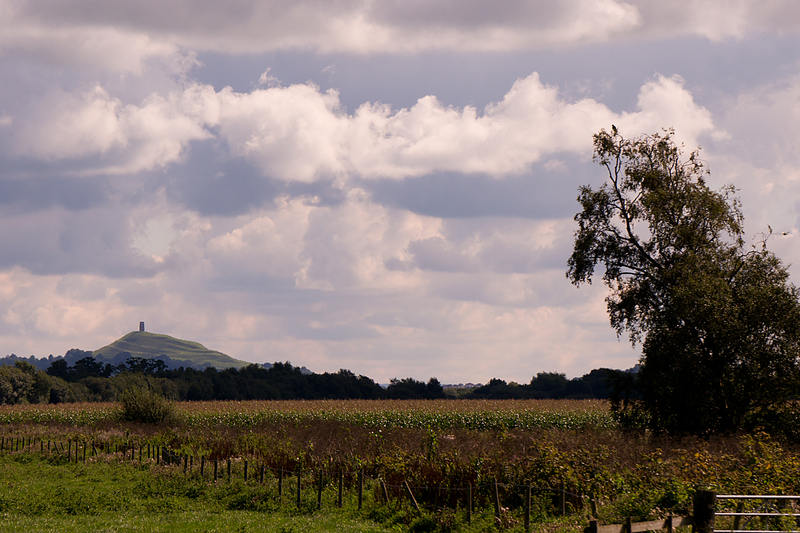 There are a couple of ridges and artificial hills, but it’s flat enough that the tower of Glastonbury Tor sticks out from miles away (above). In any case, it was pleasant, and relatively easy riding to lunch at Cheddar. Cheese-related rants aside, Cheddar does have another string to its bow; the Cheddar Gorge. 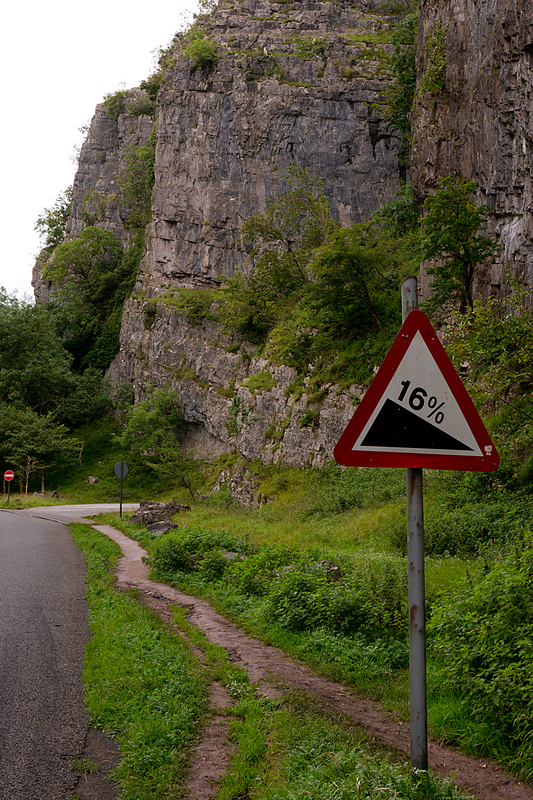 I could have looked for a flatter route to Bristol, wiggling around the Mendip Hills, rather than pushing straight over, but the Gorge is a special climb, which I really wanted to ride. There are a bunch more pictures and a review of the climb here. Not wimping out of it definitely shows how much better I was feeling. After fortification with chips and sugary drinks, it was time to hit the climb. The steeper section is about 150 vertical metres, but it’s over 200 all the way to the top. Which is not massive by world standards, but it is a decent little hill. And, despite the 16% gradient, the Beastlet and I did OK. There were even enough tourists around to give encouragement (once they’d finished laughing at the number of bags I was lugging up the hill), which was nice. And because the really steep bit is relatively early on the climb, the top section, which is somewhere around 4-5%, feels more-or-less flat. I’m putting it down as the first loaded climb which I actually enjoyed on this trip. Once over the Gorge, I was nearly on home turf. 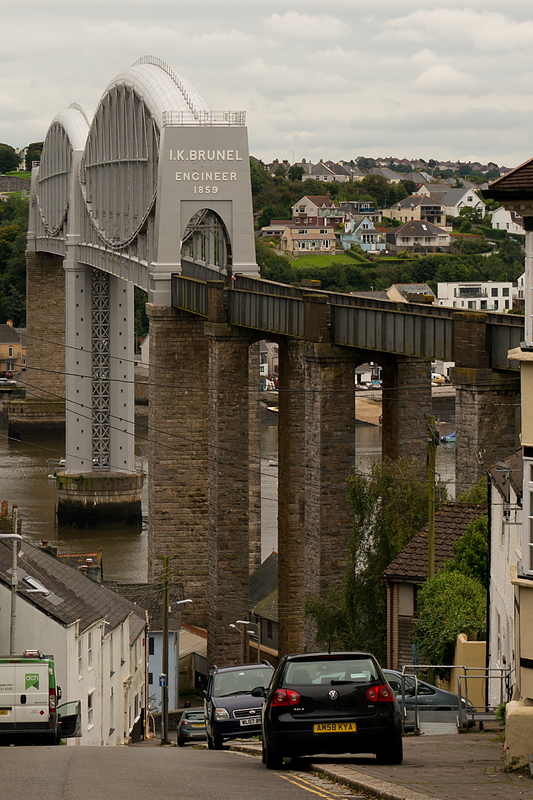 Another big lump over Dundry, and then the drop into Bristol (complete with Brunel’s – again! 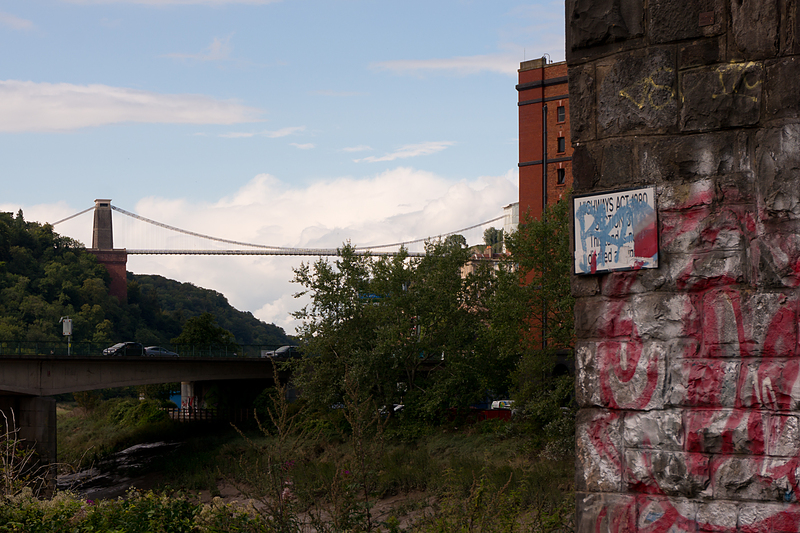 – iconic Clifton Suspension Bridge, below). Past Ashton Gate, along the edge of the floating harbour, and up the familiar railway track. Home in time for tea. And that well-deserved day off. How it goes from here is going to be largely determined by how well the back recovers; if yesterday’s anything to go by, things should be OK. There’s even a rumour that August’s awful weather may be replaced by a drier spell, at least for a few days. And so, tomorrow (Thursday) it’s off to Wales. My second country of the UK. Another language. More hills. But definitely no more fish. *The Toughness Index (TI) was developed in New Zealand, in 2014, after a conversation with fellow loaded tourer (and hill climb obsessive) Ben Greeve. It gives you an idea of how hard the riding is on any given section. TI 100 is a benchmark ‘Tough’ day on a fully loaded (say 35-45kg) touring rig. TI 100 is equivalent to climbing 1000 vertical metres per 100km (roughly 3280ft per 62 miles). A lot of the riding in New Zealand’s South Island comes out around TI 100. For comparison, crossing the Great Divide in the Rockies took me over Wolf Creek Pass, and down the other side. That 98km / 61 mile day had a TI of 90.1. Enjoyed reading the blog Tim. Although im up in Bristol we could have offered you a bed to stay in Exeter. Good effort with Cheddar. I must do it sonetime as i keep threatening to cycle up from Exeter to Bristol. How far does it work out as? Keep up the good work.